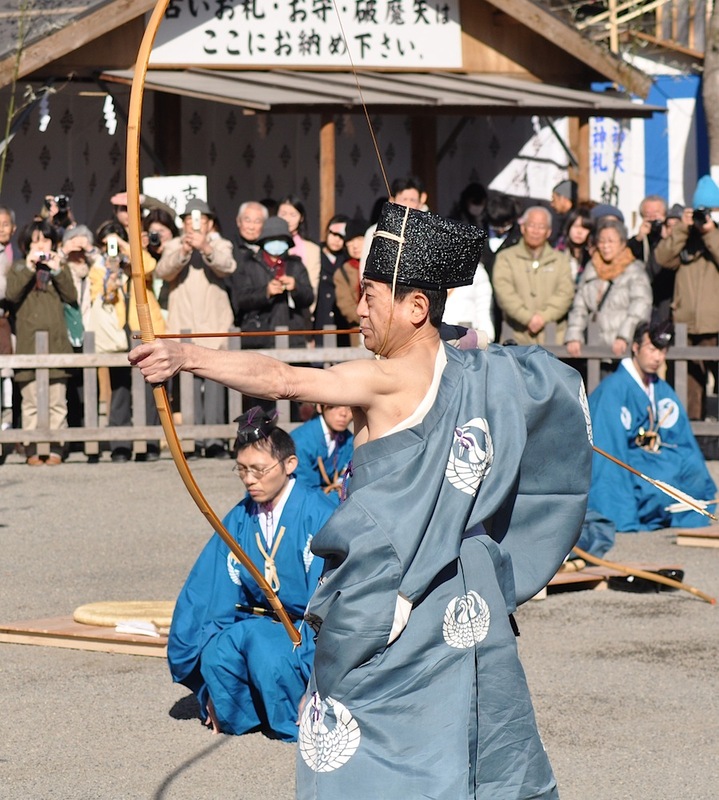 Joma Shinji is a New Year’s Japanese Archery Ritual for driving away evil for the coming year. 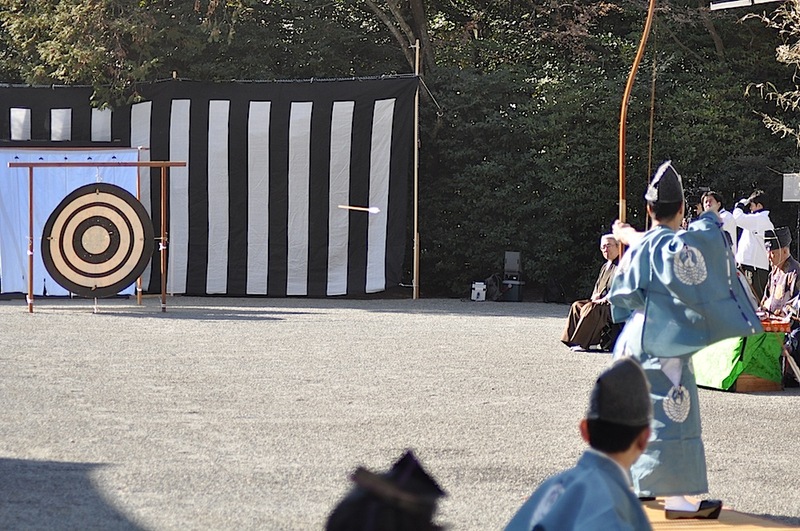 Six archers dressed in formal samurai kimono known as kariginu shoot two arrows a piece at a large circular target. On the back of the target is painted an upside kanji character for “oni” which means “devil.” Striking the target is believe to expel evil particularly shots which pass through the oni character. Since ancient times in Japan, arrows have been seen as having the power to banish and destroy evil. Even the twanging of bow strings is thought to ward away evil spirits. During New Year’s, decorative wooden arrows are sold at temples and shrines as good luck charms for the coming year. War broke out between the Taira and Minamoto and eventually the Taira were utterly defeated in 1185. It has often been pointed out that the Taira’s love of luxury and leisurely pursuits were a major factor in their downfall. Yoritomo did not want the same happening to his samurai so he decided to place his shogunate capital in Kamakura far away from the debilitating influence of the aristocratic culture of Kyoto and he encouraged the continual practice of the bow in annual rituals and contests. This is a clip I made from the Komuso Zen Priest playing the Shakuhachi (Japanese bamboo flute) for a promo for Current TV. Register and hit the green “I like it!” button, please! I encountered this Komuso while I was in Nagoya. Komuso ceased to exist from the late 19th Century onwards. The titles are bits of Zen sayings from samurai and Zen Masters. The subtitles tell the tale of the Komuso and their ultimate fate. While I was in Nagoya last month, I was walking to my temporary home for the night (i.e. an internet cafe) when I encountered a vision out of Japan’s past – a Buddhist priest playing a Japanese flute known as a Shakuhachi. The Shakuhachi player was dressed as a Komuso, a type of Zen Buddhist priest who once wandered throughout Old Japan playing their flutes for alms and meditation. Like some kind of ghost, the komuso just stood there playing his flute while people walked around the him practically ignoring him as he ignored them. It seemed a thing unreal. Centuries ago in Old Japan the streets of cities and villages were accustomed to the sight of a Buddhist priest playing a bamboo flute with his head completely covered by a straw hat. This was the Komuso. Komuso were Zen Buddhists priests who wandered about Japan playing the Shakuhachi for both meditation and alms. Komuso belonged to the Fuke sect of Japanese Zen Buddhism. Fuke Zen comes from the teachings of Linji Yixuan, a Zen teacher from China in the 9th Century. Fuke however is the Japanese name for Pahua one of Linji’s peers and co-founders of his sect. Pahua would walk around ringing a bell to summon others to enlightenment. In Japan, it was thought the Shakuhachi could serve this purpose. Fuke Zen came to Japan in the 13th Century. The priest were known first as komoso which means “straw-mat monk.” Later they became known as Komuso which means “priest of nothingness” or “monk of emptiness.” Fuke Zen emphasized pilgrimage and so the sight of wandering Komuso was a familiar one in Old Japan. Komuso practiced saizen which is meditation through blowing on the Shakuhachi as opposed to the sazen which is meditation through sitting as practiced by most Zen followers. The shakuhachi flute was the instrument used to achieve this desired state. Shakuhachi derives its name from its size. Shaku is an old unit of measure close to an American measurement of a foot. Hachi is eight which in this case represents the measurement of eight-tenths of a shaku. True Shakuhachi are made of bamboo and can be quite expensive going upwards to $5,000 in modern times. Komuso wore a woven straw hat which covered their head completely looking like an overturned basket. The concept was that by wearing such a hat they removed their ego. What the hat also did was remove their identity from prying eyes. It’s no wonder that komuso was a popular disguise for spies and supposedly the deadly ninja. When the Tokugawa Shogunate came into power over a unified Japan at the beginning of the 17th Century, the komuso came under the government’s wary eyes. Many komuso had formerly been samurai during the Sengoku (Warring States) Period (16th Century) and were now lay clergy. The potential for trouble was there because many of them had turned ronin when their masters were defeated – most likely by the Shogunate and their allies. The Shogunate instead of destroying this potential menace instead turned the komuso into a positive force, at least from their perspective. Therefore komuso were granted the rare privilege of traveling through the country without hindrance. The reason for this special permission was that many komuso had been co-opted into becoming spies for the Shogunate. And some were outright spies in komuso disguise. Only true Komuso, though, could play the honkyoku which were musical pieces of such complexity that only those adept with the Shakuhachi could perform them. Sometimes komuso were asked to perform these pieces to see if they were true komuso or the Shogun’s spies in disguise. However, it mattered little as some of the true komuso were also on the Shogunate’s payroll. In 1868 when power was relinquished by the Shogunate to the Emperor, the komuso bore a significant brunt of the animosity from Imperial forces. Komuso were so synonymous with spies for the Shogunate that the Komuso were utterly abolished in 1871 and even the playing of the shakuhachi as a solo instrument was prohibited for several years. The komuso had meddled in the affairs of the secular world and ultimately paid the price for it. The practice of the Komuso did not die out entirely though and shakuhachi continues to be played for both entertainment and meditation. The Momote Shiki ritual is carried out on Seijin-no-Hi, Coming of Age Day though the ritual predates the holiday by centuries. Momote – means “hundred hands.” The ritual is a bit of Shinto mathematics: ten archers at a time shoot two arrows a piece. The number of archers times the number of arrows equals 100. The type of arrow used has white fletching or feather. This is the same type of arrow which is sold as good luck charms at shrines during New Years. The Momote Shiki ritual is the origin of this arrow charm. The Momote Shiki ritual used to be held in private until the Edo Period (1603-1867) when it became open to the general public.